In a previous post I provide a solution on how to exclude certain categories from your feed. You can do the same with other content and I will show you in this post how you can exclude certain posts from your feed. Today a standard becomes 9 years old. But hardly ever noticed: The Syndication-Module 1.4.1 of RDF Site Summary 1.0. Apparently some of you publishing posts less than 10 times per day. Shame on you ... not! In plain English: Every feed reader should check once an hour, if you finally wrote something again. A few feed reader keep it by that but other don't. But even if there is only one: You've saved a few resources that you can use somewhere else. This post is written by Thomas Scholz - toscho.de and is a post in our Advent Calendar on WP Engineer about WordPress. Thank you very much from my part to Thomas. 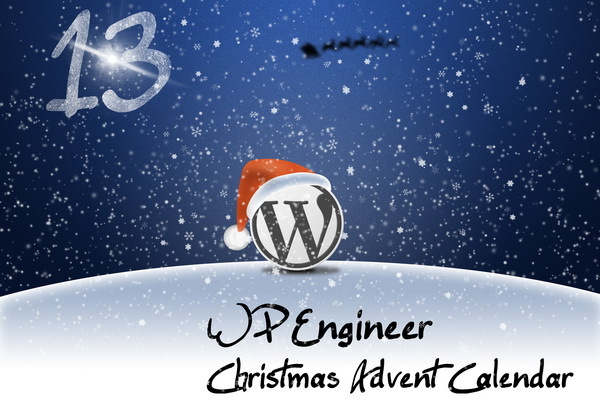 And today opens the 13th door of our Advent Calendar. You cannot only use a language key for your blog, but also for your feed:<language>en</language>. WordPress also has provided an option, but not easy to maintain. However, it is advisable to use the key according to the codec and therefore I show you some ways. WordPress already offers the possibility of own functions to read feeds and use it in your blog. Since version 2.8 of WordPress, a new feature is in use for that. So there are two ways to work with feeds in WordPress, and in both functions, the data is cached. But this is not always wanted, so I show how to take influence on caching of the two functions. It's not uncommon that a blog runs by different authors, so it may be useful if you can have a quick look at the drafts of all authors. In our joint blog WP Engineer we created a feed, which keeps us up to date if a new draft of all authors were created. The work of every author is different and the dashboard is the center of information. Therefore we have decided to supplement a widget in the Dashboard, which shows the last five drafts of all authors. I enhanced the existing Plugin Draft Feed. And the last 5 drafts of all authors in the Dashboard.